Samsung may be readying as many as 8 new Android smartphones for announcement at MWC 2013, but the highly-anticipated Samsung Galaxy S IV will surely not be one of them. 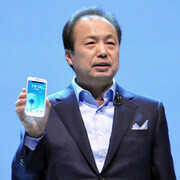 And that's not only because J. K. Shin himself said so – it turns out that Samsung won't be holding an "Unpacked" event at all, which makes those rumors of a March announcement for the Galaxy S IV seem a lot more credible now. Word comes from people "familiar with the matter" who spilled the beans for the guys at Pocket-Lint. Of course, Samsung will still have its own booth at MWC 2013 where we bet that a whole bunch of Android gadgets will be on display. In addition to the aforementioned handsets, new Android tablets are likely to be announced as well, including the rumored Galaxy Tab 3 slates, along with the Samsung Galaxy Note 8.0. At least one of them is expected to sport a high-resolution display – 2560 by 1600 pixels, and we sure look forward to checking it out first hand. But as for the Samsung Galaxy S IV, we'll have to wait a bit more before we get a chance to give it a go. Perhaps its maker needs some extra time to make enough of its Exynos 5 Octa chips, which are expected to debut in the rumored flagship, or those new, 1080p AMOLED display panels are slowing the process down. Either way, we sure hope that the wait will be worth it! that would be an interesting fight. can't predict which one will dominate. sony is too out of date now. haha right, if design wise, ill prefer galaxy s4.. galaxy s3 and note 2 outperformed all sony's and htc's last year phones in terms of camera even though samsung uses sony's lens, that makes sammy smart at doing something in their software,, ill prefer the most functional and fun UI-Touchwiz than d most elegant UI- of sony, and most beautiful widgets-of HTC.. performance-for sure they are all d same :D but touchwiz take advanatge of it by maximizing multitasking and bunch of features.. rumored 2600mah will be great.. rumored 20% less batt consmption will be greater haha removable battery and expandable memory will always be my choice even ignoring the amazing back glasses and water/dust resistant build, well if these can be combined,then great haha :D display-hmm nevermind above 400ppi will always look great. matter of preference.. im inlove wd d ads on sony xperia z abt their display, but im also in love with superAmoled :( if sammy will improve the white colors of SuperAmoled, then ill go with it lol.. and expecting tons of features from ssgs4 as what dey did during d annncmnt of s3.. The Galaxy S4 will be well worth the wait. If you own the Galaxy S2 you should be ready for the Galaxy S4 no doubt. If you own the current Galaxy S3 especially here in the States i would be definitely purchasing the Galaxy S4. It's Exynos 5 Octa is far better than the current Snapdragon dualcore processor plus that 13meg camera will be better on the S4 no doubt. Current Galaxy S3 owners should be ready only turn off is the Galaxy S4 will have jellybean instead of Android 5.0 Key Lime Pie. Myself looks like i will be waiting on the Galaxy Note 3 which will have android 5.0 Key Lime Pie out the box. Nobody beats Samsung period. Yes we all know Samsung make great phones, but your fanboyism is terrible. This isn't a marketing move. The S3 and Note 2 are far from the end of their product life cycle. If they release the S4 now, many S3 and Note 2 users will be angry as well. HTC made a lot of One X users angry with One X+. Same with Apple with iPad 4. I don't think so; When the S-III was released the S-II was introduced a year before. If Samsung releases the S-IV, the S-III also will be one year old. Same goes for the Note: When I got my Note 2 early November last year, my Note 1 also was 1 year old. So I'll expect the Note 3 to be realeased at the end of October when my Note 2 also will be 1 year old ;) And for sure I'll be with the very first users to buy the Note 3! I know the geek world is impatient to lay their eyes on the Galaxy S4, but Samsung staying on schedule is a good thing, they shouldn't rush it out nor they need to as the S3 and Note 2 are still running their cycles well, and neither the Nexus 4 and Oppo Find 5 (stock issues), nor the Xperia Z (price tag) will win over the masses. Not surprising since the GS3 skipped MWC and had it's own unpacked event. I wouldn't expect them to change that now that they are even more popular. They won't go back to a MWC unveiling until they are chumps like HTC, Sony, and LG again. Which might not be for awhile.